Angus Fraser, Senior Lecturer – Photography at UWE Bristol has won the Bar Tur Photobook Award 2014 in its inaugural year. The annual award offers an emerging photographer a publishing deal to the value of £20,000 and the opportunity to work with The Photographers' Gallery and Trolley Books over the course of a year to produce their first book in 2015. The winner was recently announced at a special ceremony in The Photographers' Gallery . 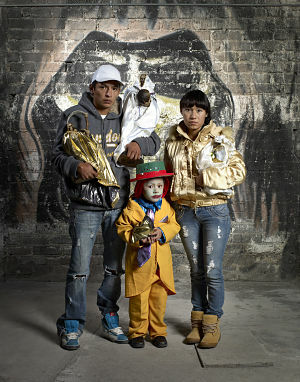 His documentary project Santa Muerte, follows members of the Mexican cult of the same name. Meaning Holy Death in Spanish, Santa Muerte is a female folk saint whose origins are thought to be traced back to Aztec rituals mixed with Catholic beliefs and practices. Although denounced by the country's Catholic Church as satanic, the cult has enjoyed an increase in popularity over the last decade especially in crime-ridden communities and among marginalised individuals. During the past three years Angus Fraser made several visits to Mexico researching, interviewing and documenting Santa Muerte devotees. His images include portraits of believers, spiritual leaders, shrines, private and public altars, paraphernalia, prayers, ceremonies, and street gatherings. His work examines the contrast between Western and Mesoamerican perception and acceptance of death. Angus was selected from an open submission of hundreds of applicants, all currently studying, or graduated within the last five years from a UK-based BA or MA visual arts courses. He was chosen by a panel of experts: Brett Rogers, Director, The Photographers' Gallery; Amnon Bar-Tur, entrepreneur and philanthropist; David Chandler, writer and curator; Nadav Kander, photographer; Caroline Metcalfe, Photographic Director, Condé Nast Traveller Magazine; Professor Chris Wainwright, Head of Camberwell, Chelsea and Wimbledon Colleges and Hannah Watson, Director, Trolley Books. For more information on studying BA(Hons) Photography, please visit the course website.